A Twitter duel has broken out between a BJP legislator from Telangana and the spokesperson of the Pakistani armed forces over a self-composed song by the politician, which the Pakistani officer claimed was plagiarised from them. 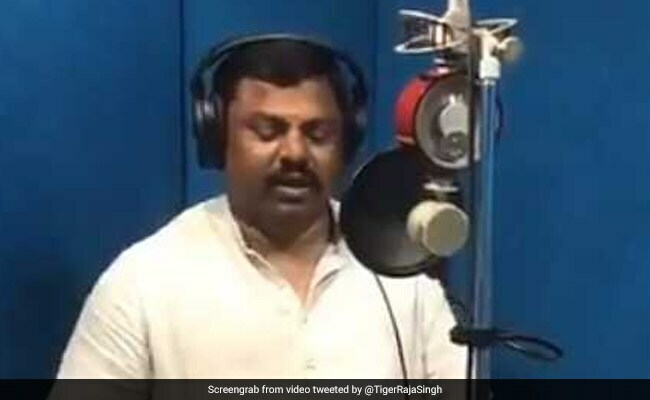 Raja Singh, BJP legislator from Goshamahal in Telangana whose Twitter profile is known by the handle “TigerRajaSingh” and features a cover photo that says “Let us establish Hindu Rashtra”, had posted a song dedicated to the Indian Army. In the clip just over a minute long, Mr Singh in a white kurta is standing in front a mic inside a soundproof room, his hand clutching a sheaf of papers with the lyrics on them. “…Hindustan zindabad,” he sings to a disco tune, slightly thumping his legs and waving his hand, fist firmly closed. Mr Raja posted the promo clip on April 12 as a sneak peek to the full song which he released on April 14. It was soon noticed in Pakistan, with many people on Twitter claiming that the song by the BJP leader was a plagiarised form of a Pakistani version that celebrated its military, which was released on March 23 for Pakistan Day. “Glad that you copied. But copy to speak the truth as well,” Major Geneneral Asif Ghafoor, spokesperson of the Pakistan armed forces, tweeted from his personal account. It drew another reply from the Pakistani officer. “Pakistani media isn’t covering the ‘so called’ song. In rest of the world this is called something else… Second sentence of previous tweet i.e. ‘But copy to speak the truth as well’ stays valid as expected. This lie too not a surprise. That’s what was said, we can’t be surprised,” said Major Geneneral Ghafoor. On his official website, Raja Singh describes himself as “very popular on social media”. “He currently has many followers around the world. He addresses them regularly through his YouTube videos,” Mr Singh says of himself on his website.